If the Green Room is good, the event that follows may be, too. Oscar and I recently got an insider's view into one of the nicest Green Rooms we've ever seen. It wasn't just one room, but almost four connected rooms. Location? The Jewish Community Center (JCC) of San Francisco, during their SF Jewish Bookfest. The JCC is a spacious, clean, beautiful building on the inside, with what appears to be ample opportunities to learn, relax, exercise, and enjoy cultural programs. It's an impressive place. 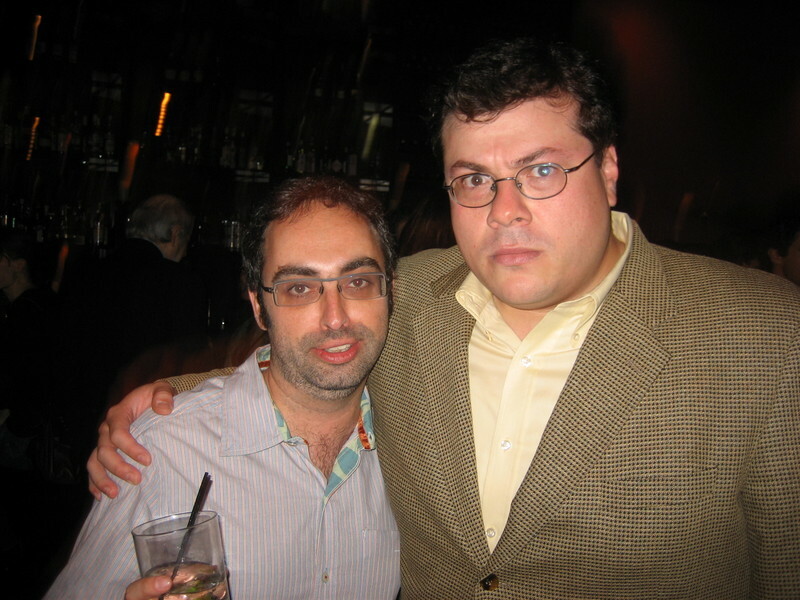 Oscar was scheduled to interview Gary Shteyngart about his latest book, Absurdistan. I was happy to accompany Oscar but also tired and peckish from catering that day (it was a Sunday). Barbara Lane, who is Director of Lectures and Literature, and a longtime friend of ours, must have noticed my weakened condition. 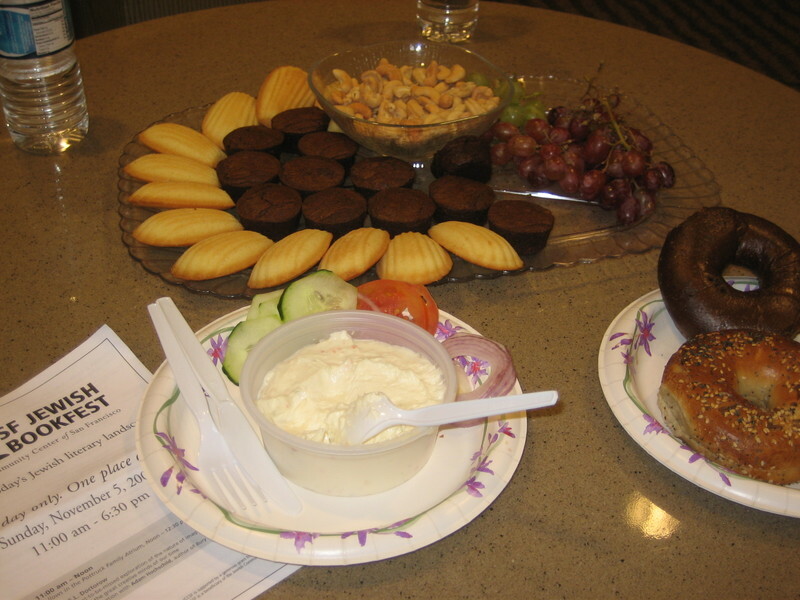 She brought in more food to the Green Room (E.L. Doctorow's leftover bagel bites sat on a plate), while she went to track down Gary. I nibbled on cashews and half a bagel with cream cheese, tomato, and cucumber. I resisted the brownie bites and other sweets. Had to save room: we were having appetizers and drinks at the 415 Restaurant after the interview. There was a fridge stocked with sodas and waters, and posters and pictures of Roseanne Barr and other famous Jewish entertainers on the walls. Oscar looked over his notes while I relaxed and sat. We could hear a cell phone ringing within 10 feet of us. The noise was coming from a giant open closet space. The ringing cell was stowed away in a jacket. Barbara eventually brought a bookseller, followed by a Rabbi in for us to meet. I was oddly nervous to meet the Rabbi, because I wanted to behave as reverently and appropriately as possible. However, I was so tired that I stammered, "Reh-bay, hello. Rabbi, I mean! Yeah... Um, hi there," when I was introduced. Reh-bay? What was wrong with me? Reh-bay?! Realizing my mistake only made me more nervous. I looked at Oscar but he didn't give me any sort of "WTF are you doing?" eyes. Maybe that relaxing Green Room space put me in a daze. We talked about it later and Oscar assured me that no, I hadn't committed the world's worst faux pas, and that Rebbe is actually a term used to address and describe a Rabbi. At left, Gary and Oscar, at 415 Restaurant. Oscar is not as angry as he appears. 415's eggplant apps were noteworthy. I passed on the chicken skewers, because they seemed too difficult to eat while schmoozing.